Mount Semeru Hiking Package Without Stay in Hotel is the most simple volcano climb package suitable for visitors who have not more time to enjoy other nature tourism in East Java, Indonesia. 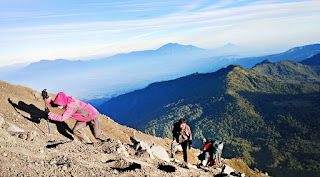 Mount Semeru hiking package also named as volcano climbing package that only need 1 night camping on Kalimati Camp and more specialist for visitors who have good experience in volcano hike. If You have not an experience before to hike steep volcano, You can choose Mount Semeru hiking 4 days 3 nights with more relax climbing and stay 2 nights camping on Kumbolo Lake and Kalimati Camp. Semeru volcano hiking package better begin from Surabaya or Malang and You must start at early morning around 04.00 - 05.00 AM because the trip from Surabaya, Malang is 5 hours and Semeru volcano hiking activity normally closed at 12.00 PM. So You must reach Ranu Pane (climbing start location before mid day). Detail itinerary, Read more below. Finish registration, start M accompanied by local guide and porter toward Kumbolo Lake for 4 hours. Reach Kumbolo Lake, stop for lunch while break enoughly. Continue hike to Kalimati Camp 3 hours (along your climb, You will see green views around Ayek Ayek Peak. Arrive at Kalimati, then stay 1 night by camping while having dinner with the porter service. Wake up at 00.00 AM, then Start Semeru volcano hiking for 3 - 4 hours. From Kalimati Camp, The hiking condition is very steep, You must take a good care. Very recommended using the tour guide to lead your climb to the peak. Get the Semeru volcano summit at 04.30 AM, waiting for sunrise appearance at 05.20 AM then continue enjoy the beauty of Sunrise and view from the highest volcano in Java Island until satisfied. Finish enjoy the beauty of Mount Semeru landscape, continue hiking down to Arcopodo and Having breakfast here. Afterward, comeback to Ranu Pane by stop at Kumbolo Lake. After you get Ranu Pane, comeback to your Car or Van then comback to Surabaya Airport, Malang, also possible continue to Banyuwangi Port. Reach your location request finish Mount Semeru Hiking Package 2 days 1 night. Mount Semeru Hiking Package Without Stay in Hotel only recommended for visitors who have not time in East Java. If You are interested in this tour package, very suggested to stay 1 night in Hotel around Surabaya, Malang after finish climb because this climbing tour package will ended at 04.00 - 05.00 PM in Ranu Pane. Before You start your trekking tour, Very suggested to bring climb equipments such as Jacket, Gloves, Hat, Trekking Shoes, Pole and other personal tools because the temperature on Semeru Peak around 02 - 03 degree centigrade and it has steep route. Detail information about Mount Bromo tour package and Mount Semeru volcano hike package, Accommodation and other facilities, You can visit Our Contact.